Durham's Station was just another depot for the occasional passenger or express package until early April 1865 when a Federal Army commanded by William T. Sherman occupied the nearby state capitol of Raleigh during the American Civil War. The last intact Confederate Army, commanded by General Joseph E. Johnston, was headquartered in Greensboro 50 miles to the west. After the surrender of the Army of Northern Virginia by Robert E. Lee at Appomattox, Virginia, General Johnston sought surrender terms, which were negotiated at Bennett's Place, a farm halfway between the lines about 3 miles west of Durham's Station. While what could have easily been a battle in Durham was averted, the wholesale looting of houses in the Durham area by Union cavalry, in what people thought was a truce period, led to a bitterness towards Republicans and the North that lasted well into the 20th century. Prevented from further investment in the tobacco industry, the Dukes turned to the then new industry of electric power generation. Duke Power (now Duke Energy) brought in electricity from hydroelectric dams in the mountains. At this time (1910–1920), the few towns and cities in North Carolina that had electricity depended on local "powerhouses". These were large, noisy, and smoky coal-fired plants located next to the railroad tracks. Duke Power quickly took over the electricity franchises in these towns and then electrified all the other towns of central and western North Carolina, making even more money than they ever made from tobacco. Duke Power also had a significant business in local franchises for public transit (buses and trolleys) before local government took over this responsibility in the mid to late 20th century. The success of the tobacco industry in the late 19th and early 20th century encouraged the then-growing textile industry to locate just outside of Durham. Drawing a labor force from the economic demise of single family farms in the region at the time, these textile mills doubled the population of Durham. These areas were known as East Durham and West Durham until they were eventually annexed by the City of Durham. Durham quickly developed a vibrant Black community, the center of which was an area known as 'Hayti' (pronounced HAY-tie), just south of the center of town, where some of the most prominent and successful black-owned businesses in the country during the early 20th century were established. These businesses — the best known of which are North Carolina Mutual Insurance Company and Mechanics & Farmers' Bank — were centered on Parrish St., which would come to be known as "Black Wall Street." In 1910, Dr. James E. Shepard founded North Carolina Central University, the nation's first publicly supported liberal arts college for African-Americans. The area is predominantly Democratic, and has voted for the Democratic Party's presidential candidate in every election since the city's founding in 1869. Durham is an activist community and politics are lively, visible, and often contentious, and like many communities, often dealing with issues of race and class. The shifting alliances of the area's political action committees since the 1980s has led to a very active local political scene. Notable groups include the Durham Committee on the Affairs of Black People, the Durham People's Alliance, the Friends of Durham, and Traction. Compared to other similarly sized Southern cities, Durham has a larger than average population of middle class African-Americans and white liberals. Working together in coalition, these two groups have dominated city and county politics since the early 1980s. Durham operates under a council-manager government. The mayor since 2001 is Bill Bell, who was most recently reelected in 2007 with 58% of the vote. The seven-member City Council is the primary budgetary and lawmaking authority. Federally, Durham is part of North Carolina's 4th congressional district, represented by Democrat Dave Price, elected in 1996. 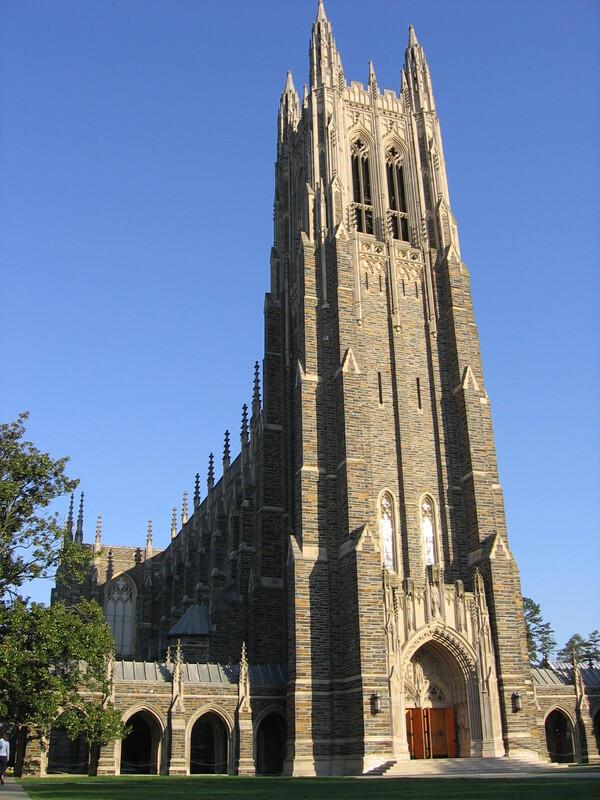 Duke University is one of the premier universities in the United States and the world, with around 14,000 students split evenly between graduates and undergraduates. Duke's 8,600-acre campus and Medical Center are located in western Durham, about 2 miles from downtown. Duke forms one of the three vertices of the Research Triangle along with the University of North Carolina at Chapel Hill and North Carolina State University. The University's research, medical, and teaching efforts are all among the highest-ranked in both the United States and the world. Most travel in Durham is by private vehicle on its network of public streets and highways. Important arteries for traffic include NC 147, which connects Duke University, downtown, and Research Triangle Park, U.S. 15-501 between Durham and Chapel Hill, and I 85, connecting Durham to Virginia and western North Carolina cities. Over 95% of commuters use a car to get to work, with 14% of those people in carpools. Durham maintains an extensive network of bicycle routes and trails and has been recognized with a Bicycle Friendly Community Award. The American Tobacco Trail begins in downtown and continues south through Research Triangle Park and ends in Wake County. Air travel is serviced by Raleigh-Durham International Airport, which enplanes about 4.5 million passengers per year. Frequent service (5 flights a day or more) is available to Philadelphia, Atlanta, New York LaGuardia, New York Kennedy, Washington Reagan, Washington Dulles, Chicago O'Hare, Dallas, and Charlotte. Daily international service is also available to London Heathrow. Duke University also maintains its own transit system, Duke Transit operates more than 30 buses with routes throughout the campus and health system. Duke campus buses and vans have alternate schedules or do not operate during breaks and holidays. Durham is located on the western side of the Piedmont region at 35°59′19″N 78°54′26″W﻿ / ﻿35.98861, -78.90722 (35.988644, −78.907167). Like most of the region, its topography is generally flat with some rolling hills. The city has a total area of 94.9 square miles (245.8 km²), of which, 94.6 square miles (245.1 km²) of it is land and 0.3 square miles (0.7 km²) (0.29%) is water. The soil is predominantly clay, making it poor for agriculture. The Eno River passes through Durham, along with several other small creeks. ^ http://www.privateschoolreview.com/county_elementary_schools/stateid/NC/county/37063 Retrieved May 9, 2011. This page uses content from the English language Wikipedia. The original content was at Durham, North Carolina. The list of authors can be seen in the page history. As with this Familypedia wiki, the content of Wikipedia is available under the Creative Commons License.